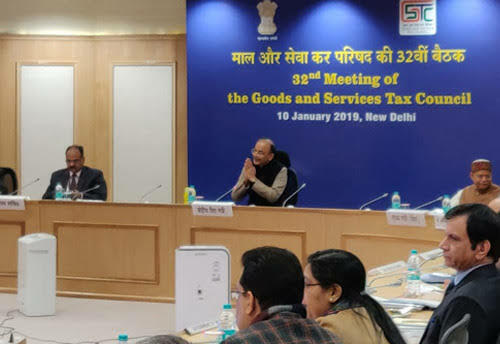 3.1 The said Scheme Shall be applicable to both Service Providers as well as Suppliers of Goods and Services, who are not eligible for the presently available Composition Scheme for Goods. 3.2 They would be liable to file one Annual Return with Quarterly Payment of Taxes (along with a Simple Declaration). 4. Effective date: The decisions at Sl. No. 1 to 3 above shall be made operational from the 1st of April, 2019. 5. Free Accounting and Billing Software shall be provided to Small Taxpayers by GSTN. i. A seven Member Group of Ministers shall be constituted to examine the proposal of giving a Composition Scheme to Boost the Residential Segment of the Real Estate Sector. 7. Revenue Mobilization for Natural Calamities: GST Council approved Levy of Cess on Intra-State Supply of Goods and Services within the State of Kerala at a rate not exceeding 1% for a period not exceeding 2 years.